Continuing on my Citrix Cloud focused series of blog, in this article i have concentrated on Active Directory Forest/Domains consideration when deploying citrix cloud. As the Citrix cloud connector performs AD management , allowing the use of AD forests and domains within your Resource Locations it is important to understand where the cloud connectors need to placed from a active directory point of view. Multiple domains/forests are commonplace in enterprise environments, either through security practises or multiple acquisitions. Cloud Connector cannot transverse domain-level trusts, therefore additional cloud connector should be installed per user domain. Citrix Cloud Hosted Storefront cannot authenticate user’s in domain not listed in the Identity & Access Management Domain List. I’ll test a number of different scenario’s so you can understand where cloud connectors needs to be placed to cover your total authentication requirement. 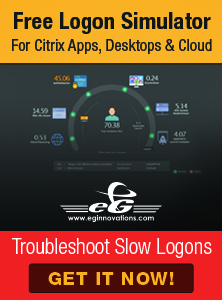 Identity and Access Management Citrix Cloud Configuration. AD User & Groups/Library Subscriptions User & Groups: Domain Local Group created called “ctxgroup” on CCTEST.LOCAL with ctxuser1 in CCTEST.LOCAL added. As expected the resource are enumerated. AD User & Groups/Library Subscriptions User & Groups: Domain Local Group created called “ctxgroup” on CCTEST.LOCAL with ctxuser1 in CCTEST2.LOCAL added. As per above error , the request is denied. Only domains that appear on the Identity and Access Management are allowed to log into Cloud Hosted Storefront. AD User & Groups/ Library Subscriptions Domain Local Group created called “ctxgroup” on CCTEST.LOCAL with ctxuser1 in UK.CCTEST.LOCAL added. Log into Citrix cloud hosted Workspace (new name for storefront) with user in UK.CCTEST.LOCAL Domain with access to resources. Reviewing the identity and access management in the Citrix Cloud, the child domain now appears. The cloud connector had to be rebooted and was not discovered instantly to detect the additional child domain has been added. AD User & Groups/Library Subscriptions Domain Local Group created called “ctxgroup” on CCTEST.LOCAL with ctxuser1 in CCTEST2.LOCAL added. Although it logs in which indicates authentication , there is no resource available to the end user as cloud connector has been unable to transverse domain-level trusts. As indicated by limitations , the cloud connector cannot transverse domain-level trusts. Testing all of the scenario’s called out at the beginning of the article here is an overview of the scenario’s and conclusions when testing against the Citrix cloud hosted storefront vs resource location provided storefront. It’s quite clear, that for cloud hosted storefront to provide access to resources a cloud connector cannot use trusts, although a parent/child domain is allowed and is discovered in Citrix Cloud domain lists. Resource Location provided Storefront will allow access to any forest level trust but cannot transverse through domain level trusts so consideration around your own specific forest/trusts need to be understood. Below is a workflow diagram that will allow you to understand where cloud connectors need to be deployed to allow users access to appropriate resource via Citrix Cloud. Any feedback/Comments are welcomed to improve/add to this article. Thanks for the feedback , I’ll update and correct. You should consider using the free Grammarly tool to grammar check your articles. The paid version is way too picky for me. I have no idea if you are a native English writer, or not, so I hope I do not offend you with these suggestions. First of all thank you for your blog ! I didn’t find this informations in other locations ! I am deploying a new Citrix Cloud environment for a customer who has 4 AD Forest with each one domain. Each AD Forest are trusted. Based on your experience, could you confirm me the choices I have ?